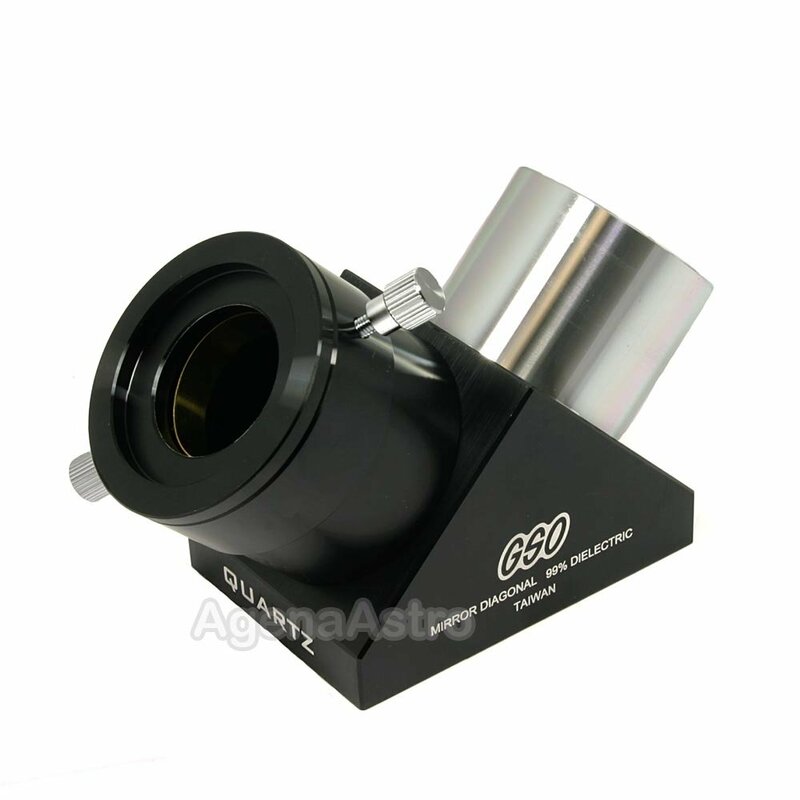 If you want a high-end mirror diagonal for your refractor telescope, this GSO 2" Quartz Dielectric Diagonal Mirror is an excellent choice. GSO's 2" refractor diagonal features dielectric coatings with 99% reflectivity across the visible spectrum and a 1/12 wave quartz mirror. The all metal diagonal body is CNC machined. The combined result is a superb diagonal offering excellent mechanical and optical quality at a great price. Dielectric coatings are more durable than regular or enhanced aluminum coatings, so you will enjoy years of excellent performance from this product. Diagonals with comparable quality and specifications often sell for $200 or more in today's astronomy market. High quality diagonal mirrors are usually made of BK7 glass. Quartz glass goes a notch higher - it offers greater thermal stability, resulting in minimal thermal expansion and contraction as compared to other glass types. The result is a minimal, if any, shift in focus due to temperature changes over long observation sessions, making this quartz diagonal ideal for photographic and imaging applications. The 2" chrome barrel of this diagonal on the telescope end is threaded to accept standard 2" filters. A 1.25"-2" adapter is included so you can use this diagonal with 1.25" or 2" eyepieces. The 1.25" and 2" holders both feature a brass compression ring, so your eyepiece barrels will not be scratched by the set screw. The 1.25"-2" adapter is also threaded to accept 2" filters. The clear aperture is 46.6mm. The diagonal comes in a very nice foam-fitted storage box and includes 2 end caps. Weight = 1lb-3oz. (with 1.25" adapter); 1lb. (without 1.25" adapter). Made in Taiwan. 4.4 (Based on 18 Reviews) 89% of reviewers recommended this product. Better than I thought it would be, very pleased with it, would recommend to any one. Works as advertised. Excellent views. Holds all my 2" eyepieces securely. Nice product at a very reasonable price. Upon opening the box I was impressed by the size and weight of the diagonal compared to 1.25" diagonals. That heft was the primary reason for the purchase, to give greater security and stability when using heavy eyepieces or camera. I also want to use 2" eyepieces in the future. The high quality suggested by reviews and confirmed in my use, the functionality of the 2" size and the reasonable price made this diagonal a very satisfying purchase. A very nice piece of equipment. Received the diagonal in a timely manner in good condition. Works very well in my SW 120ED Pro Refractor. Build quality seems very good. I've noticed darker, and more crisp fields with this GSO diagonal over the stock prisms that came with my scopes. One item I received had the wrong fitting on it, evidently from the factory, but I was shipped a new one right away. I do think Agena should check the boxes before shipping, but they were very helpful and friendly. Very nice 2" star diagonal used in a C80EDR. Minimal scatter, very good views. Machined from solid aluminum. Smooth barrel (a good thing). Unique zero-height eyepiece adapter. Great value. Review by C6R User of OH. The unit is well machined with good fit and finish. All of my 2" filters (from several different manufacturers) screwed in smoothly. I had to tighten down the clamp ring a little more than expected on a few of my eyepieces, but I was able to get a solid grip on everything in my collection. The views with this diagonal are noticeably better than with the stock diagonal that came with my Celestron C6R. I tested the 2 diagonals on the Moon and Jupiter with 6mm, 8.8mm, 12.5mm, 18mm and 20MM 1 1/4" eyepieces from Zhumell and Explore Scientific. All the images seemed a bit crisper in the 2" GSO diagonal. The view seemed a little brighter with the 6mm Zhumell and 2" diagonal on Jupiter. When I unboxed my unit there was a good bit of dust and a some large black particles on the mirror. The black particles looked to be flakes of the diagonal's interior blackening and were likely knocked loose in shipping. The amount of dust was annoying, though. Fortunately a few puffs of air from a squeeze bulb cleaned things up. Review by Navegante of Tenerife Canary Islands. It is extremely difficult to get E.P.s into the diagonal. The Brass collar slips out of place and either stops the EP from going in or almost locks it in place. I have to check the placement of it all the time which in the dark, is sub optimal. In addition, the 1-1/4" adapter sits way too far into the diagonal. Meaning, the set screw for the 1-1/4" EP is recessed in the wall of the diagonal and its difficult to figure which to loosen. Review by Doug of Finger Lakes, NY. 4.0 Great product, price and service! GSO is Taiwan-based company that has long had a very good name in Astronomy. 10 years ago, they supplied the dobsonian telescope for companies like Orion and the reputation for functional, solid build and decent quality control has remained solid. Mainland China has caught up, but I still look to GSO for reliable optics at a good price. I bought this diagonal to use with a Mewlon 210--a very high quality instrument--and this diagonal fits in quite well. The machining is very well done, and the optics appear to perform very well. I have no doubt that it's built to last. I have purchased several things from Agena-astro and the service is bar-none. Shipping is fast, issues are resolved, they stand behind their product. Review by Bone-Yard SD of Rapid City, SD. Really good SCT diagonal. I used it for visual and with my mallincam to do AP. The images are very bright and I noticed no degradation from the mirror at all. The reason I bought this was that it just didn't make sense to save 30 bucks on a piece of equipment you'll most likely hold onto for the rest of your life. I think it could definitely last that long! This is as good as the diagonal of TV. However, since the 31.7mm adapter is low profile design, if I use Ng zoom 2-4mm, I need an extension tube when I combined with TSA-120. In addition, when I plug the adapter into the hole, or out of the hole, it is often trapped. This diagonal has been subjected to a stop. 2-inch barrel do not hit the mirror. I can remove the barrel, so I am easy to put a flocked paper in the barrel, and easy to clean. Review by NickH of Oregon Coast. I bought this diagonal as my newly purchased refractor did not have one. This one caught my eye and I checked other people's reviews. It was well received and the price is very competitive. I will second that sentiment here. Review by albireo of Baltimore, MD. I used this diagonal mirror for my 5 inch refractor (BORG 125SD). I fully enjoyed the star gazing by this mirror without any deficits such as los of brightness, decrease of contrast and artificial color. Quality fit and finish. High-end features. Great price! I recently decided to replace the non-compression ring style 2” diagonal on my CPC 1100. Many manufacturers offer numerous variations today – enhanced coatings, dielectric coatings, Pyrex, quartz, etc. A well-known ‘East Coast’ company made my original diagonal and since I was pleased with its performance I naturally checked their product line first. However, their current 2” dielectric diagonal retails for nearly $300! Further research ultimately led me to Agena AstroProducts whose product line includes several 2” diagonals. I was interested in the 'refractor version' of the 2” GSO compression ring version. It features 99% reflectivity dielectric coatings, a 1/12th wave quartz mirror, 1¼” eyepiece adapter, and sells for $129! Since this is less than half of the price of the ‘famous’ diagonal it would be a true bargain if it was any good at all. I placed an order and received the diagonal quickly. The diagonal itself was in a nice foam-lined box. The GSO 2” dielectric, quartz diagonal includes a plastic 2” cap for the telescope end, a 2” to 1¼” adapter, and a plastic 1¼” cap for the eyepiece end. The adapter is an interesting ‘recessed’ design. If additional in-focus is needed, this type of adapter allows smaller eyepieces so sit about ¼” ‘lower’ than the standard style adapters. Like the diagonal itself, the adapter also includes a compression ring. The GSO diagonal is a three piece design. It consists of the main body, the tube that holds the eyepiece, and the tube that’s inserted into the focuser. The body and eyepiece tube are black anodized. The focuser tube contains a ‘safety under-cut’ and is chromed or polished. Interior surfaces are anti-reflection blackened. While the one piece style of the ‘famous’ diagonal insures the mirror is accurately positioned, a three-piece design can perform just as well if properly executed. Cosmetically, the GSO diagonal looked great! This is nice, but optical performance is what really counts so the first clear night, I installed the GSO diagonal in my CPC 1100. I can’t honestly say that I saw a dramatic difference between the GSO and my original diagonal, but it certainly performed very well. Since my goal was simply to obtain a diagonal with a compression ring, the dielectric coatings and quartz mirror were nice extra features. A great product for a great price! If you’re considering a 2” diagonal, be sure to check out the GSO 99% Dielectric Quartz Diagonal.